Annual Awning Maintenance | Van Gelder Enterprises Inc.
Spring is here which means its time for spring cleaning! After you’re done cleaning out your closet and scrubbing the kitchen floor, you should head outside and take a look at your awning. Awnings go through a lot of wear and tear during any given year. From debris buildup from trees all year to sun-baking in the summer months, annual maintenance is crucial for extending the quality and life of your awning. You can start by cleaning off your awning. Depending on the material, this could entail taking the awning down if its removable or power washing it if it’s a permanent fixture to your outdoor space. Focus on getting rid of any sort of build up including leaves, dirt and grime. This might take some elbow grease and a special cleaner, but it’s worth it. Dirt can built up and discolor or damage the awning, while piles of leaves can attract birds and other animals. Completely cleaning your awning will also give you a better visual when it comes to the annual inspection. 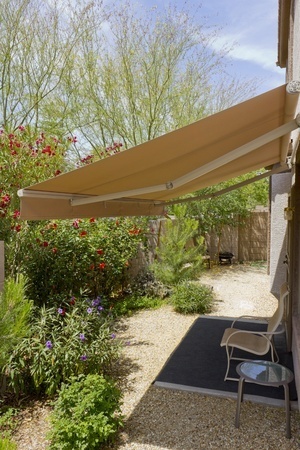 After the cleaning process, you should go through a close inspection of your awning. Look at the top, bottom, underneath and all elements in between. Look specifically for rips, tears, stretching or discoloration. Tears in the awning can let water in and slowly but surely extend turning a small slit into a gaping hole. Professionals can easily patch small rips or tears. When they are found early on they can be fix preventing a larger problem that would require replacement. Discoloration or stretching could be a sign of a larger problem like a water leak or infestation of birds. Weather can also cause problems. The sun can fade awnings and wind can stretch out pliable material over time. Depending on the material of your awning, it could be repainted or re-finished to look like new without having to pay for a whole new awning. Fading and stretching depending on severity could be fixed, but might cause a panel of the awning or the entire awning to be replaced. Stability is the next element of your awning that you should check. Often held in place by metal bars, awnings can be bent and twisted by extreme weather like wind or snow. Testing the strength of each rod can help prevent the awning from falling down. It can also prevent a piece of pipe from dislocating and ripping the awning material. Loose parts of an awning can be fixed by just tightening a few screws but if left alone could cause the entire awning to fall. In regions with extreme weather conditions, awnings should always be kept stable and steady, ready for the elements. Every year you should inspect your awning for damage and functionality. When years go by without close up testing and examination, small problems become bigger or expensive problems that are difficult to fix. Finding and repairing a small tear can cost $20, but letting that rip turn into a stretched out gash can mean a whole replacement awning that could cost thousands out of pocket. Getting into the routine of annually inspecting your awning every year is especially beneficial to preserving your awning.